Cadmium is an established human and animal carcinogen. Most evidence is available for elevated risk for lung cancer after occupational exposure; however, associations between cadmium exposure and tumors at other locations including kidney, breast, and prostate may be relevant as well. Furthermore, enhanced cancer risk may not be restricted to comparatively high occupational exposure, but may also occur via environmental exposure, for example in areas in close proximity to zinc smelters. The underlying mechanisms are still a matter of manifold research activities. While direct interactions with DNA appear to be of minor importance, elevated levels of reactive oxygen species (ROS) have been detected in diverse experimental systems, presumably due to an inactivation of detoxifying enzymes. Also, the interference with proteins involved in the cellular response to DNA damage, the deregulation of cell growth as well as resistance to apoptosis appears to be involved in cadmium-induced carcinogenicity. 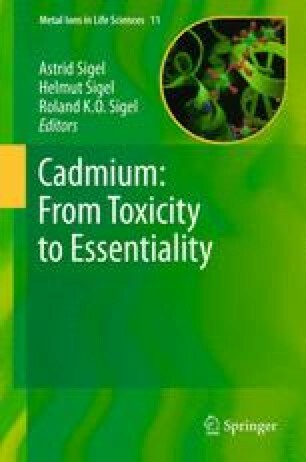 Within this context, cadmium has been shown to disturb nucleotide excision repair, base excision repair, and mismatch repair. Particularly sensitive targets appear to be proteins with zinc-binding structures, present in DNA repair proteins such as XPA, PARP-1 as well as in the tumor suppressor protein p53. Whether or not these interactions are due to displacement of zinc or due to reactions with thiol groups involved in zinc complexation or in other critical positions under realistic exposure conditions remains to be elucidated. Further potential mechanisms relate to the interference with cellular redox regulation, either by enhanced generation of ROS or by reaction with thiol groups involved in the regulation of signaling pathways. Particularly the combination of these multiple mechanisms may give rise to a high degree of genomic instability evident in cadmium-adapted cells, relevant not only for tumor initiation, but also for later steps in tumor development. The author would like to thank Dr. Gunnar Jahnke for critical reading of the manuscript. Research conducted in the author’s laboratory was supported by the Deutsche Forschungsgemeinschaft and by BWPLUS.